Doireann Ní Ghríofa grew up in Co. Clare, Ireland. Her poetry has been published in several anthologies and journals. She was among the prize-winners at the Oireachtas Literary Awards 2010, was shortlisted in Comórtas Uí Néill 2011, and was awarded an Arts Council Bursary. Her second collection, Dúlasair, is published in 2012. 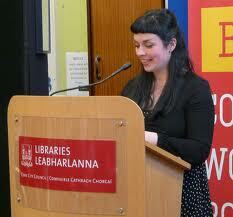 These poems present Doireann's work in English and Irish and were published in Issue 21. Map was published in Issue 23. Spiralling down to unknown depths. Up from ripples with a wistful whisper, unseen. Ina neadacha, iad síolta mo smaointe. Réalta reatha idir ghéaga gharbha. Tightened by tendrils of ivy. That glint in tangled twigs. Lán le macallaí na nua. Níor mhothaigh sí géire an mhapa. Le blaincéad bán a leaba sa bhaile. Down the long, slender limb. On her bed at home.